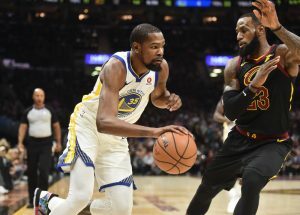 Golden State Warriors yet again managed to seal another victory over Cleveland Cavaliers in their third clash of the NBA finals with a score of 110-102. Warriors now hold a 3-0 lead over Cavaliers. The match was played at the home of Cavaliers at Quicken Loans Arena in Cleveland. Kevin Durant from Warriors made history in this game by becoming the fifth player in the NBA finals history to score a total of 43 points on 23 shots. The other four players are Shaquille O’Neal, Magic Johnson, Jerry West and Michael Jordan. However, on the other hand, Lebron James scored a total of 33 points, 10 rebounds and made 11 assists but even this couldn’t help the Cavaliers win the third game. Stephen Curry was also not in the mood today as he scored only 11 points and a three-pointer in the whole match. 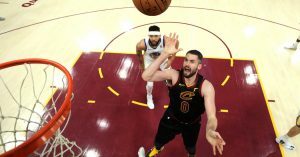 What a start from Cavaliers as Kevin Love from Cavaliers scored the first three points followed by Tristan Thompson who made two straight dunks. After that, Lebron James did an unbelievable move by throwing an alley-oop to himself and performed a brilliant dunk with his both hands. The score at this point was Cavaliers Vs Warriors 14-4. After that, Lebron again scored when he was fouled by one of the opponents and Cavaliers were now leading Warriors with 8 points upfront. However, Warriors scored after some time and the scores were now Cavaliers Vs Warriors 22-14. After a while JR Green of Cavaliers was replaced by Rodney Hood who in no time committed a foul on Kevin Durant. Warriors then scored on the foul and now they were only six point behind Cavaliers. After a while, Klay Thompson scored the first 3-pointer for his team and the lead was cut to five. Cavaliers weren’t able to score for some time. Whereas, on the other hand, Shaun Livingston and Durant from Warriors chipped in some buckets and the score was now Warriors Vs Cavaliers 26-26. After that, JR Smith scored a three-pointer for Cavaliers while Kevin Durant of Warriors scored 2 points and the 1st quarter came to an end. The scores were now Cavaliers Vs Warriors 29-28. The Golden State Warriors substituted three of their players which were Nick Young, David West and Shaun Livingston. The Cavaliers took advantage of their subs and quickly scored 6 points. After that, Steve Kerr, head coach of Warriors, immediately called a timeout. The scores were now Cavaliers Vs Warriors 35-28. After the break, Jordan Bell scored for Warriors but Lebron James answered him by dunking a beautiful basket. Cavaliers were ahead of Warriors and JR Smith soon extended their lead by scoring a three-pointer. While, on the other hand, Jordan Bell again made a layup but Lebron again replied him by scoring two points. The scores were now Cavaliers Vs Warriors 42-34. After some time, Kevin Love from Cleveland hits a three-pointer and they were now leading Warriors with a total of 14 points. Kevin Love scored another three-pointer for Cavaliers but the Warriors replied with Kevin Durant hitting a three-pointer followed by Klay Thompson who scored a beautiful basket for the Golden State. The scores at this point were Cavaliers Vs Warriors 52-42. Stephen Curry scored a three-pointer after a while followed by Jordan Bell who dunked a beautiful basket. Cavaliers failed to score for a while whereas, on the other side, Durant again hit a three-pointer and cutted down the lead. Kevin Durant was on fire today as he again hit a three-pointer. He had now scored 24 points for Warriors as the first half came to an end. The scores of the first half were Cavaliers Vs Warriors 58-52. Warriors came back in action after the half as JaVale McGee scored six straight points for Warriors followed up by Kevin Durant’s three-pointer. And the scores were now equalized Cavaliers Vs Warriors 61-61. After three minutes, Stephen Curry scored two points and the Golden State got their first lead of the match. Lebron James then tried to recover the lead by assisting Tristan Thompson but McGee on the other hand replied by scoring again. Draymond Green and Durant also scored after that for Warriors after which a timeout was called by Cavaliers coach Tyronn Lue. It was a great comeback from Warriors as the scores now were Cavaliers Vs Warriors 64-69. But George Hill and JR Smith both scored a three-pointer followed by Lebron’s runner after six minutes and the qualized the score 72-72. While, Kevin Durant, started scoring points again for Warriors and were now leading Cavaliers by 1 point. Soon, the third quarter came to an end and the scores were Cavaliers Vs Warriors 81-83. As the 4th quarter started, Rodney Hood scored the opening two points for Cavaliers. Jordan Bell replied Cavaliers by hitting two points but Hood levelled the score by hitting a floater. The crowd was on their feet as the score was equalized but Kevin Durant silenced them by scoring a beautiful basket. Kevin Durant has now scored 36 points for his team as he was in great form. The scores at this point were Cavaliers Vs Warriors 87-88. Stephen Curry tried to score a three-pointer after some seconds but missed it. After Cavaliers gained the possession, Lebron scored and Tyronn called a timeout for Cavs. After the timeout, Draymond Green and Andre Iguodala scored for Warriors while Lebron James on the other hand, scored two points in reply. The scores now were Cavaliers Vs Warriors 94-95. Kevin Durant scored after some seconds but Kevin Love sinked two baskets after that and Cleveland were now leading Warriors with 1 point. 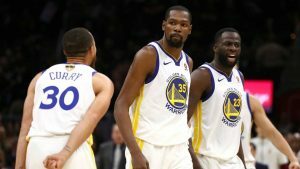 But Warriors came back in action as Stephen Curry scored from mid-range and he immediately hits a three-pointer after gaining the possession back from Cavs. 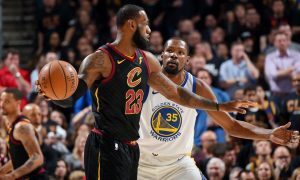 Although, Lebron scored a three-pointer after a while but it wasn’t enough as Kevin Durant again scored a 3-pointer followed by Andre Iguodala dunk. The scores at this point were Cavaliers Vs Warriors 100-108. With only 2 minutes left in the game, James scored another layup but Draymond Green answered him by scoring a critical two. JR Smith tried to score a three-pointer in the dying minutes of the game but failed to do so. The whistle blew and Warriors again won the match by 8 points. Kevin Durant made history today by scoring a total of 43 points, seven assists and 13 rebounds for his team. Do Join allsportspk as soon as possible, so that you can see the Game 4 between Warriors vs Cavaliers on 9 June.